I am so tired. This month's daring bakers challenge was truly one of the most challenging dishes I've ever made. Hosted by two lovely friends, Deeba and Aparna, the challenge was to make Tiramisu from scratch. Which means (and this is a hold your breath moment), you make your own mascarpone, your own ladyfingers, zabaglione and pastry cream. Both zabaglione and pastry cream require that dangerous act of cooking egg yolks into something custardy, but with risk of ending up with scrambled eggs. This one was truly way out of my league. Aparna had warned me that this will take 2-3 days so I finally got myself to start one night two days ago. The first step was making mascarpone. I've made paneer countless times so it wasn't hard. You heat the cream, then add lemon juice, let the whole thing curdle a bit and let it drain overnight. And you get such creamy cheese, I will never buy mascarpone again. Next morning, I made three components of the dish (which is when it got a little manic). First, zabaglione - egg yolks, sugar, vanilla and marsala (but kahlua in my case) cooked gently in a double boiler until it becomes like a thick custard. Which it did, despite my fear that everything would look like scrambled eggs. The next one was vanilla pastry cream which also involved equally involved cooking of egg yolks with flour, milk and sugar. I ditched the vanilla extract called for and used vanilla seeds in both of these. They looked perfect, both the custards. But to me, they smelled and tasted eggy. Have I told you how much I hate the smell of eggs in desserts - I could smell eggs all the way in zabaglione and secretly plotted to have someone eat the tiramisu. By this time, I also realized that I could not make the regular ladyfingers. It was way too many eggs for me. So I went ahead with Aparna's recipe to create eggless ladyfingers - a nutty shortbread like cookie. Then all of this in the fridge and off I went to work. Last night was the assembly night. The only component left was whipped cream - cream, vanilla and sugar whipped to soft peaks. Once that was done, I mixed up mascarpone, zabaglione and pastry cream. Folded in the whipped cream to form a delicious mixture. Dipped the ladyfingers in kahlua and arranged in a glass dish. Added a layer of cream, another layer of ladyfingers and a final layer of cream. Then, on a lark, I did another plating with all components laid out separately so you can eat what you like in your tiramisu. The other one is now set and dusted with cocoa. And guess what! It doesn't taste eggy at all. In fact, it tastes like the most delicious tiramisu I've ever eaten. Thanks, Deeba and Aparna for forcing me to go so out of my comfort zone. This is one recipe I would have never made on my own. ue. Whetever "egginess" is there doesn't figure in the final dessert. Oh yum delicious Simran. The deconstructed is a great take on this dessert! No egginess at the end of the day because then neither aparna or I would have eaten it! Glad we pulled you out of your comfort zone...you can always count on us to do that!! It was a pleasure to host the challenge! 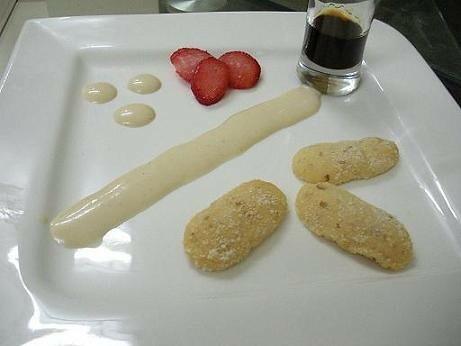 Lovely idea to make a deconstructed tiramisu. This was a great challenge. Me too like your deconstructed version. Well i am sure we will have to pay a lot if they serve this in places as it looks so special served like this. That is a lot of work... hats off to you!